So I don’t know about you, but whenever I’m on the verge of another holiday season, my thoughts inevitably turn to three things: giving thanks, celebrating the birth of Jesus, and finding the very best snack cracker options. You weren’t really expecting that third thing, were you? However comma it’s no big secret that I love me a cracker. I especially love a good cracker with some sort of cheese or dip option. Or maybe even a cheesy dip option. And I am tempted to say that I also enjoy a cracker with a dippy cheese option (just for consistency’s sake), but I’m not really sure what a dippy cheese option would be. I am all for exploring the possibilities, though. In the past I’ve mentioned some of my very favorite crackers: the Wheat Thins Toasted Chips in Garden Veggie, the Sweet Potato & Sea Salt Triscuits, the Cracked Pepper & Olive Oil Triscuits, any store brand of lavasch crackers (preferably with lots of seeds on top of them), Mary’s Gone Crackers in herb, Sesmark Sesame Rice Thins, and last but not least, the incomparable Cheddar Jack Cheez-Its. Never, ever underestimate the power of a good Cheez-It, my friends. A few weeks ago I tried a new flavor of a cracker I actually bought for the first time this past spring, and while I’m trying to manage my expectations and keep a level head about me, I am just crazy about it. In fact, it’s right up there with the Mary’s Gone Crackers (MGC has been my favorite cracker for the last few years), and it is so light and delicious and perfect for a softer cheese. Y’all. It is a cracker superstar. I’d tried the Sea Salt variety of the Crunchmaster Multi Grain Crackers before, but this one – the Rosemary & Olive Oil Multi Seed Crackers – is on a completely different level. The real genius is that they’re not too heavy on the rosemary (a little goes a long way with me), and they’re small, crispy, and strangely fresh-tasting for a product that comes in a resealable pouch. I’ve been buying these crackers at either Fresh Market or Publix (they’re next to the deli in Publix), so they seem to be pretty easy to find. But if you haven’t seen them around, you can check your ZIP code on the Crunchmaster website and hopefully find a nearby store that carries them. And by all means, if you’ve been enjoying a favorite cracker as of late, please feel free to share your thoughts and cracker-related observations in the comments. After all, it’s the holidays. It would be a shame to hide your cracker light in a bushel. Maybe that can be Nabisco’s new slogan. Well, right now I’m watching game #10 of the College World Series, and I’m fascinated that there’s a player for the University of North Carolina named Skye Bolt. FASCINATED. I’m also really excited for him because clearly he is destined for an unstoppable career in meteorology once he completes his studies in Chapel Hill. I mean, I’d watch severe weather updates with Skye Bolt all the livelong day. And Skye Bolt with tomorrow morning’s forecast? YES MA’AM. BELIEVE I WILL. All righty. Here are a few links I’ve been wanting to pass along. – This post of Ann’s took my breath away. It also made me want to go back to Uganda RIGHT NOW. Or at the very least next week. – I mentioned this on Twitter last week, but it is my deep and heartfelt belief that this song is going to be this fall’s college football anthem. CUE THE MONTAGE. – Y’all know that I love my Bulldogs, and this year’s baseball team has been especially fun to watch. They have a huge College World Series game Friday at 2:00; if they win, they’ll be one of the final two teams and play in next week’s three-game National Championship series. This ESPN article really gets to the heart of the team’s personality – I got such a kick out of it. – Don’t forget to check out the latest posts by the Compassion Bloggers in Nicaragua. Whether you’re sponsoring a child, thinking about sponsoring a child, or wondering if child sponsorship actually works, you’ll be encouraged by what you read. – A couple of days ago I read that Stephen Colbert’s mother passed away. Today I watched a video of his beautiful tribute to her life, and I can’t stop thinking about it. You may need a tissue or nine. Hi. I Have Some Links. Please Do Enjoy. Today I’m trying (once again) to get caught up on various deadlines and obligations and whathaveyou, but I wanted to pass along some links because, well, I’m dependent on lists right now. But when I finish all this stuff I’m working on, I am going to WEAR Y’ALL OUT with the paragraphs and, lo, EVEN SOME POINTS. Seriously. It’s gonna be a banner day. It may even call for cake. – One day last week my husband mentioned that peach cobbler sounded good to him. So, selfless soul that I am (make no mistake: I have never met a cobbler that I did not like), I decided to try a new cobbler recipe. I guess I was feeling kicky. Anyway, I tried this recipe of Paula Deen’s, and y’all, it is delicious. It’s more of a cobbler cake than a it is a biscuit-y cobbler, so the texture has been a nice change-o-pace. I’ve made it with peaches and blueberries, and both have been big hits in our house. – Yesterday the little guy had a golf lesson that started at exactly the same time as the Bulldogs’ Super Regional baseball game. You can appreciate my dilemma. I ended up listening to the game in the car during A.’s lesson, and then we heard the last inning as we were driving home. Should you ever find yourself in a similar situation, please know that I do not recommend driving during the 9th inning of a Super Regional. It’s terrible for the nerves. However, we are SO TICKLED that the Dogs won and are going to Omaha for the College World Series. Their first game is Saturday at 2, so I think it goes without saying that I will be (very discreetly) listening to the game on my phone during my book signing at 3. I can’t imagine that you’re surprised. – Speaking of book signings (I know. I’m so sorry. I feel so awkward. There is just no good way to mention this stuff. ), there are two more on the horizon (after the one in Birmingham this Saturday). I’ll be at Reed’s in Tupelo, MS on Monday, June 17th from 3:30-5:00, and there’s another one at Book Mart in Starkville, MS (somebody ring a cowbell one time) on Saturday, June 22nd from 10:00-12:00. There’s a possibility that State’s second CWS game may coincide with the Tupelo signing, so I very well may pass out from happiness. Or stress. Depending on how the game goes. – If you are a loyal Mad Men viewer, you don’t want to miss this analysis of the most recent episode. So good. – There’s a mighty good discussion about summer reading going on over at Melanie’s blog. The comments are a wealth of book-related info. – I’ve made my peace with the fact that the search for a great mascara is going to be an ongoing quest in my life. A few months ago I broke down and bought a more expensive department store brand, and even though it was great at lengthening my pitiful little eyelashes, it took forever to dry – which means that I inevitably had smudges within five minutes of putting it on. Sort of inconvenient. Week before last I picked up a tube of Cover Girl Lash Blast Fusion in the drugstore, and I really, really like it. It adds volume and it lengthens, and my nine eyelashes are very appreciative. – One of my favorite singer / songwriters is Daniel Renstrom. I’ve mentioned his music before (because I love it), and he has a new album that might be just the ticket for mamas of young kids here at the beginning of summer. It’s called Jesus Wants My Heart, and it’s full of songs for family worship time or for car time. The songs are simple enough that your kids (or grandkids / nieces / nephews / godchildren) can sing along, but they’re so meaningful and rich that you’ll love them, too. Yay for kids’ music that doesn’t make the grown-ups want to throw things! All righty. I’m gonna get back to All The Writing. Hope y’all are having a great Tuesday! Hi. I Have Some Links. – I’ve written a couple of TV-related posts over at Ree’s blog this past week. The first one is some spoiler-heavy speculation about Scandal, and the second one is all about The Rachel Zoe Project. As always, I’m tackling the tough issues. – If you’re a fan of Don Draper and company, you will get a huge kick out of reading Alan Sepinwall’s weekly Mad Men recaps. His observations (and the comments) are smart, insightful, and thought-provoking (especially if you like a healthy dose of symbolism, foreshadowing, and whatnot). Good stuff. 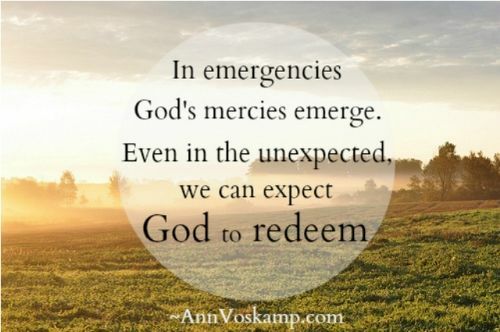 – I saw this on Ann’s blog this morning, and it struck me as just right in light of yesterday’s tragedies. Praying with you and for you, Boston. “Let the dying moments remind us where to find the living…” – an absolutely beautiful post by Emily. Yes, Lord. Thank you, Lord. And just an FYI: I prefer lime juice over lemon juice in black bean hummus, but the Holy Spirit may lead you in a different direction. Our church has been studying the book of Matthew for the last few months, and the whole series has been so rich and timely and good. I thought several weeks ago that I wanted to link specifically to Bart Box’s sermon on The Sermon on the Mount, and the fact that I just remembered probably says a lot about my current mental state. Anyway, the whole series is excellent (this past Sunday’s message was exactly what I needed to hear), so I thought I’d share. I love having a notepad right by my computer, and if it can double as a mousepad, all the better. This past week I ran in the bookstore for a few things, and when I saw this cute, encouraging notepad/mousepad, it made me smile. It’s colorful and handy – especially if you’re like me and still like to write out your to-do lists the old-fashioned way. This one is also mighty cute. If you’re interested in joining our 4th Annual NCAA Tournament Challenge, you can join our group now. We can’t fill out brackets until after Selection Sunday (March 11th), but feel free to go ahead and join the group. A six year-old little boy named Fatao lives in poverty in Burkina Faso and suffers from a heart defect called ventricular septal defect. He needs heart surgery, and he’ll have to travel to India to get it. So while Fatao is part of a Compassion Child Development Center, his medical expenses – approximately $23,000 for travel, visas and surgery and follow-up care – are so great that Compassion is helping him through their Medical Intervention Fund. You can get more information on the Compassion blog, and you can make a one-time donation on the Compassion website. Just a few dollars from each of us would help so much. My friend Annie’s most recent post is so good. Chock-full-o-wisdom for teenage girls. And for 20-somethings. And for any-somethings, really. I think these earrings are the perfect blend of modern and traditional. 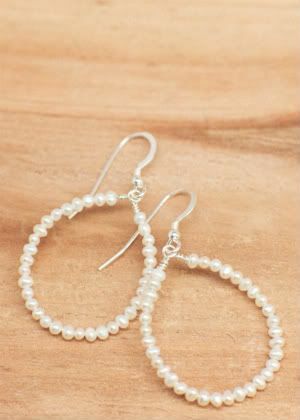 You could wear them on your wedding day, or you could wear them with jeans and a cute t-shirt. Love. I’m one of those people who thinks the trouble that we’ll go to to protect, you know, OUR TELEPHONES is sort of ridiculous. But when we switched cell phone providers and got new phones a few months ago, I realized that my tendency to drop my phone + a fragile phone = a need for a good cell phone case. I asked D to order me the heavy-duty case of his choosing – just to please get it in turquoise if he could. I thought that the turquoise might make me feel better about turning my cute new phone into a glorified vinyl brick. I have to say, though, that I have adored my heavy-duty Otterbox Defender case. It’s very grippy, so it makes the phone easy to hold, and the grippy stuff also keeps the phone from sliding around on my desk or passenger seat or wherever. There’s also a protective screen that goes on top of the real screen, so there’s no risk of the phone getting scratched up in my purse. AND, when I *may* have accidentally dropped my phone on our garage floor a few weeks ago, I picked it up – fully prepared to see all manner of shattered glass – and the phone was totally fine. 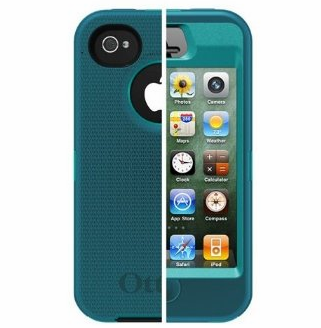 Otterbox, you’ve made a believer out of me. I have worn all sorts of gray polish the last six months. Gray with a touch of green? Check. Gray with a touch of brown? Check. Gray with a touch of purple? Checkity check check. I’m a little gray’d out. 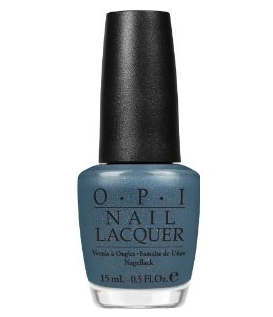 So when I saw this shimmery dark blue the other day, I thought it looked like a fun change-o-pace. I’ll let you know how it goes after my next trip to the nail salon. Like most people, I was so sad when I heard the news about Whitney Houston’s death a couple of weeks ago. I have loads of great memories associated with her music – which is why this Ben Rector video made my heart smile.